Get all the items to complete the whole set. Added to both the collections, residential and community, the new "3tiles shapes" that are placed in the middle of 4 tiles. Even if I have tested all the items in different game configuration, I'd like to know if someone get problems with the lights of the single doors that I have manually added to them......... any report will be appreciate. Single and Double Door with Glass. Single and Double Door with Glass and chequered frame. Single and Double Wooden Door. In the archive ML_IndependentExpression_DoorsAndArch_ALL.rar you'll find ALL the doors and arch. You'll find the items in the Build Mode catalog - Doors/Arch, as usually. All the items have the automatic diagonal that shows up when you put a door/arch on a diagonal wall. All these items borrow the textures from the original "Independent Expressions Inc." window therefore, if you want to recolour them just create a recolour for the original window. Use Object Workshop and create a recolour for the Window - 2 Tile - Plate Glass, that is the master of the entire set. Your recolour will apply to the original windows, as well as to these new elements. 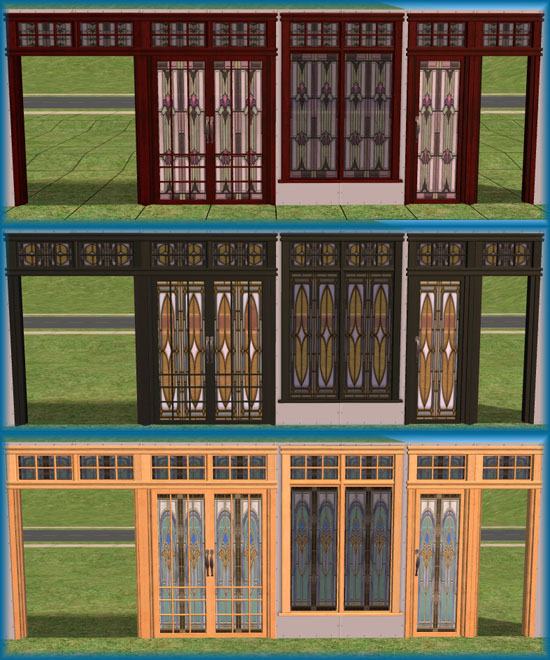 Every recolour for the original window that you may already have will be automatically available for all the doors and arch. The polygon count is different according with the shape. Maxis: For the original "Independent Expressions Inc." windows.